Vesicoureteral reflux (VUR) is a congenital anomaly in which the urine refluxes backwards from the bladder up into the kidneys. This condition is related to an abnormal valve mechanism being present at the insertion site of the ureter into the bladder. 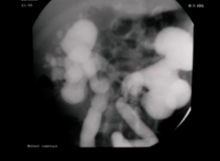 In most cases, VUR is detected in children that have urinary tract infections, although some cases are detected at birth due to the presence of hydronephrosis (swelling of the kidneys) on a prenatal ultrasound. The primary concern with VUR is the increased incidence of kidney infections (pyelonephritis) in these children, which in turn, can lead to scarring of the kidney and permanent kidney damage. Given the high incidence of VUR in children that have urinary tract infections (UTIs), a work up to evaluate for the presence of reflux is recommended in any child with a febrile UTI, children with recurrent UTI, or in any child with an abnormal renal ultrasound. VUR is detected by performing a voiding cystourethrogram, a test in which the bladder is filled with contrast via a catheter and images of the kidneys/bladder are obtained with the bladder filling and emptying. Reflux is graded on scale of I to V based on the severity of the reflux and dilation of the upper urinary tract (Figure 1). In most patients, VUR can be managed conservatively with a daily prophylactic dose of an antibiotic to prevent infections until the reflux either resolves spontaneously or is corrected surgically. Some children with low grade reflux and no history of recurrent or febrile infections may be a candidate for observation without antibiotics. In many children, reflux will resolve spontaneously. Resolution rates depend on the age of diagnosis (the younger the better), the grade of reflux, and whether the reflux is unilateral or bilateral. Children who have breakthrough UTIs despite antibiotic prophylaxis, reflux that fails to resolve spontaneously, high grade reflux, or significant renal scarring are usually counseled to undergo surgical correction of the reflux. The surgical options for correcting reflux include ureteral reimplantation, a procedure in which the ureter is reimplanted into the bladder in fashion that restores the normal flap valve mechanism of the ureter. This procedure usually requires a 1-2 day hospitalization and has a very high success rate (98%). Because of the high success rates of the procedure, a VCUG is usually not required post-operatively. The alternative to ureteral reimplantation is the endoscopic administration of DefluxTM beneath the ureteral orifice. This increases resistance at the entry of the ureter into the bladder and prevents the reflux of urine into the ureter. The advantages of this technique are that it can be performed on an outpatient basis without need for an incision. The procedure takes 15-20 minutes and is associated with minimal recovery time. The success rates with the technique (80-85%) are not as high as with ureteral reimplantation, and for that reason a post-operative VCUG is usually recommended. The technique is also not recommended for children with very high grades of reflux or in the presence of other anatomic abnormalities of the ureter/bladder.